Considered as one of the most unconquerable forts of the country, Jalore Fort has a famous saying about itself- “Let the sky be torn, the earth turned upside down, let the iron armor be cut to pieces, body fighting alone, but Jalore would not surrender”. Built in traditional Hindu architecture style, the Jalore Fort is erected over a steep hill 1200 Meters high. Jalore fort was built so high that it was suitable to have a panoramic view of the whole town. Hence, the whole city was commanded from over there. The actual construction period of Jalore fort is unknown, however it is believed that the fort was built in between 8th-10th century. Jalore city was ruled by the Parmar Rajputs in the 10th century. 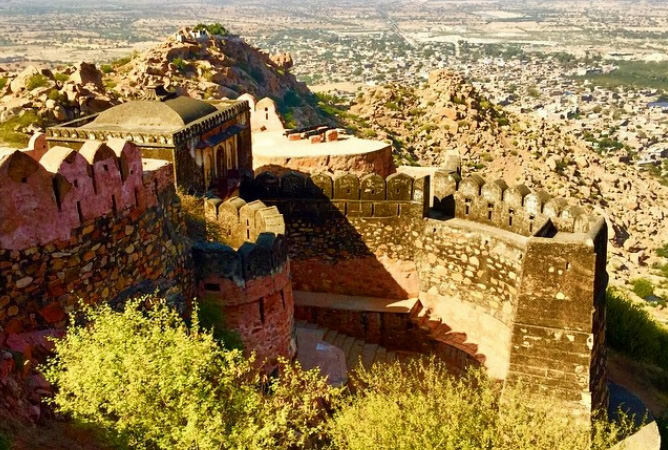 Jalore Fort is a 10th century fort and one of the nine castles of “Maru” (Desert) that was under the Parmaras (A dynasty of Rajput Kings). It was in 1311 when Ala ud din Khilji, Sultan of DelhI attacked and destroyed the fort. The ruins of the fort are prime attractions of the tourists, who come here to have a sneak peek into the History of India. When Ala Ud Din Khilji attacked the Jalore Fort and many of the Rajput soldiers attained Martyrdom, their wives burned themselves to death by jumping into a pond of burning fire, so as to save their honours from opposing army. This was a popular tradition of highest sacrifice amongst Rajput women and known as “Jauhar”. The main attraction of the fort is the desolated (by Ala Ud Din Khilji) Residential Palace here, which now is left with ruined symmetrical walls with huge rock formations around it. From Hindu temples to Mosques to the Jain temples, representing the holy places of different rulers of this place, you will find all of them inside the Jalore Fort’s complex. Nearest Airport is Jodhpur Airport which is just 141 Km from Jalore. At the airport itself, cabs and taxis to the Jalore Fort are abundantly available. Being located besides the National Highway No.15, One can reach to Jalore via Rajasthan Roadways/ Private Bus Services from Jaipur, Ajmer, Ahmadabad, Surat and Bombay. Nearest railway station is Jodhpur, which is well connected to all the major cities of India, via Indian Railways.